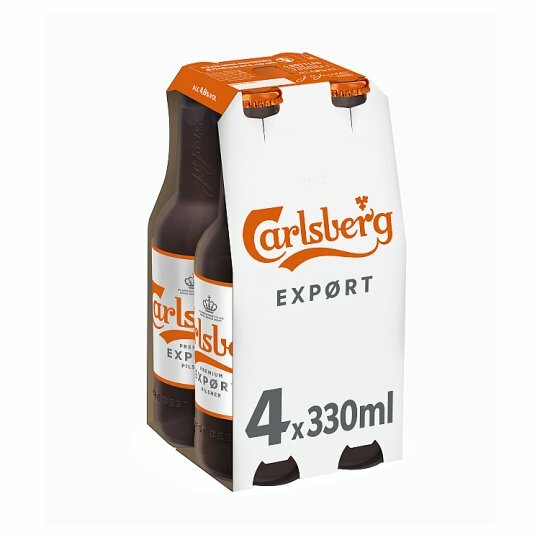 Carlsberg Expørt is a 4.8% ABV premium pilsner with a satisfying full bodied malty flavour, crafted by our UK master brewers using a unique Danish recipe and yeast. We Danes love to share, it's in our nature. That's why at Carlsberg we've been exploring our finest beer since 1869. And to this day, we still share our unique purified yeast to our Master Brewers in the UK - so that you can enjoy this full-flavoured premium Pilsner at its very best. Skal! We want you to enjoy our beer at its best, every time. Our ZerO2 Cap is cleverly designed to reduced oxygen in the bottle, to prolong the flavour of the beer. Tak. Smooth and crisply refreshing, satisfying full bodied malty flavour and light biscuit notes, perfectly balanced to the last drop. Carlsberg Expørt refreshing full bodied Danish pilsner, best served chilled in a Carlsberg Expørt pint glass and most of all with friends. Caslberg Expørt pairs especially well with light meats like grilled chicken, and steaks as well as pasta dishes and salads.